(NaturalNews) Humankind has overreached to the point of suicide. Many of the systems that currently perpetuate modern life are entirely unsustainable and doomed to inevitable collapse. These systems include global debt and fraudulent finance, the mass poisoning of the food supply with agricultural chemicals, the destruction of ecosystems, deforestation, soils destruction, the usurpation of individual human rights and freedoms, the total incompetence of Big Government and the mass consumption of finite supplies of natural resources that will sooner or later run out. This doesn't even consider the additional risks stemming from Obama's attempts to provoke war with Russia, Obama's transplanting of infectious disease migrants into U.S. cities, or the risk of a nationwide grid down scenario stemming from high-altitude EMP attacks or solar flares. 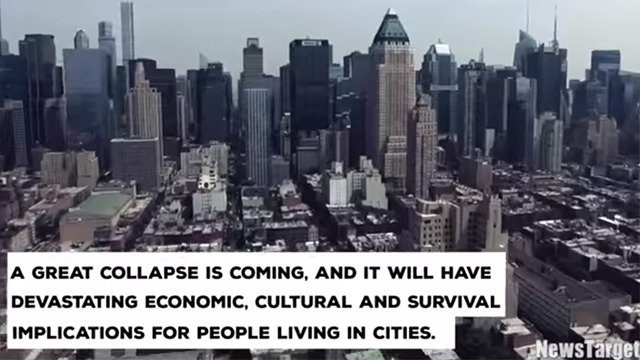 * A great collapse is coming, and it will have devastating economic, cultural and survival implications for people living in cities. * Over 50% of the U.S. population currently lives in a high-density population area. * No high-density population area is equipped to handle critical infrastructure failures. * Those failures may include electricity, water, food stamp transactions, police protection, fire, EMT and hospital services. * As society breaks down, we will all witness mass social chaos, looting, arson, mayhem and murder across America's largest cities. * Police will be overrun and helpless. Those unable to defend their lives and survival supplies will be robbed and killed. * Many more will die from sheer stupidity and a total lack of even the most basic survival skills such as knowing where to find water when the grid goes down. * Young people will be among the largest casualties because America's failed education system has produced an entire generation of youth who have no practical skills whatsoever. * Scientists describe a mass die-off as a "natural selection" event. * Natural selection means "survival of the fittest" and is a universal principle in nature. * Humankind has lived in a state of temporary suspension of natural selection, exploding its population to 7 billion people while creating "perfect storm" conditions for a mass die-off. * As the mass die-off unfolds, only those capable of survival will live to reproduce. * Those who are too stupid to survive are thereby removed from the human gene pool, eliminating the "stupid" genes that now dominate today's artificial society run by morons (Idiocracy). * Will YOU be among the survivors? Or will you perish with the ignorant masses?